Michal Brezina of the Czech Republic lead the men after his solid Short Program to Japanese Kodo Drums. It is figure skating’s equivalent of opening day—the first day of the ISU’s Grand Prix of Figure Skating competition. This year the first stop is Ontario, Calif., for Skate America where more than 50 athletes compete for the right to compete in the Grand Prix Final later this year in Quebec City, Canada. On Friday, the men and ice dancers saw action, and got the season off to a promising start. The men were the first to take to the ice, and got the season off to a promising start. Michal Brezina, the 21-year-old from the Czech Republic, took a commanding lead over reigning World Championships silver medalist Takahiko Kozuka and teammate Daisuke Murakami from Japan. 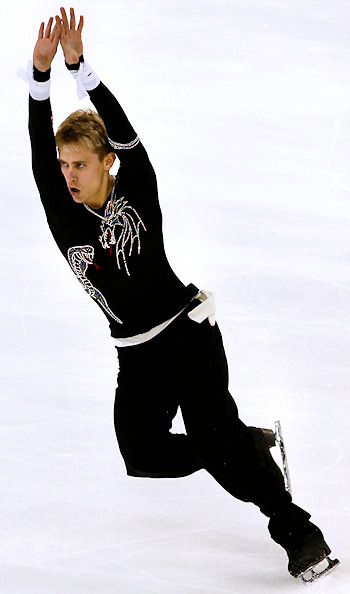 Brezina, whose highest finish in a Grand Prix event was third back in his debut in 2009, was the class of the field with an effortless performance of his Japanese Kodo Drums short program. “I’m happy that I am done with the short program, and I feel like I had a good, clean skate,” said the leader. Brezina opened with an easy triple Axel, and followed that up triple flip-triple toe loop combination. Though rumored to be landing several different quadruple jumps in practices in advance of arriving in Ontario, Brezina chose to skip the move in tonight’s program. Brezina, who demonstrated amazing control of his blades while interpreting his music with aplomb, earned 79.08 points for his short program. Kozuka fell on his opening quadruple toe loop attempt, and seemed tentative throughout his Inner Urge short program. Dressed in a dynamic pair of red pants and a fun black and red shirt, Kozuka failed to capture his usual pizzazz at any point in the program, leaving the audience nonplussed as he took his final bows. “I was nervous because this was the first competition of the season, and I hadn’t competed in a long time,” said last year’s Grand Prix Final bronze medalist. Kozuka is in a virtual tie with four other skaters separated by less than one point, but is more than eight points behind Brezina. His total of 70.69 points leaves him in a very precarious position heading into the free skate. Finishing in third place just .02 points behind Kozuka, was 20 year-old southern California native Daisuke Murakami, who competes for his native Japan. Murakami skated the most technically demanding program of the evening; opening with a quadruple Salchow-double toe loop combination, while also completing a solo triple Axel and triple flip. Murakami skated to Peter Gabriel’s The Feeling Begins, and finished with 70.67 points. Veteran international competitor Kevin van der Perren of Belgium skated a clean short program to music from Cirque de Soleil, but did not have the finesse that others skaters in the competition can showcase. Still, the two-time European medalist earned 70.09 points in the competition, and stands in fourth place heading into the free skate. The top ranked American man is southern California’s Richard Dornbush, 20, the reigning U.S. silver medalist. Dornbush gave a credible performance, but was held back by an under rotated triple Axel in his routine to Beethoven’s Symphony No. 5. Dornbush earned 70.03 points in his senior Grand Prix debut for a fifth place finish. Kazakhstan’s Denis Ten finished in sixth, while Team USA’s Armin Mahbanoozadeh, last year’s bronze medalist, finished in seventh. Mahbanoozadeh plans to do a quad toe in the long program. European Champion Florent Amodio, USA’s Douglas Razzano, and Italy’s Samuel Contesti finished in eighth, ninth, and 10th, respectively. Razzano was not pleased with his skate.